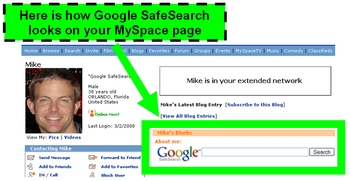 If you or anyone in your family has a MySpace page and you want to provide a safe Google alternative for them, here is how to add Google Safe Search for Kids to a MySpace page. 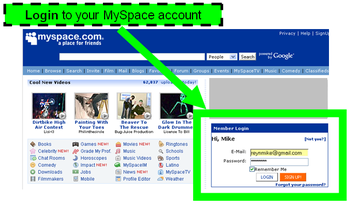 Log into MySpace, click "Home" and then "Edit Profile". Choose the appropriate section for your Google Safe Search box (I recommend the beginning of the first section. 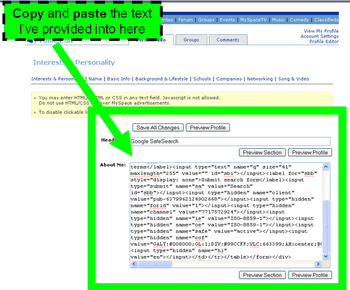 Copy the text in the box below and paste into the beginning of your "About Me" section. Then click "Preview Section" and then "Save All Changes". To see your Google Safe Search box in action, you will need to click on "View my profile" or click on "Home" and then "Profile". 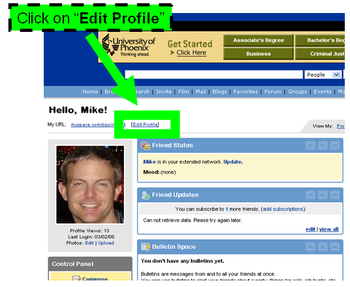 Here is how Google Safe Search looks on my MySpace page. If my instructions don't work right for you, please contact me (Mike Reynolds) and I will personally help you set this up. Using Google Safe Search for Kids is the most popular page here on SquirrelNet, showing that many people value "safe" Google results. Another reason is that Google itself doesn't allow a person to "lock into" SafeSearch, meaning it's very easy to reset preferences to allow inappropriate content. Using our links here at SquirrelNet is one way to lock into Safe Search as long as you are searching from here. I don't know if any of you use iGoogle, but if you do, I recommend adding Google SafeSearch for Kids to your iGoogle. I went ahead and built a Google Gadget that "locks into" SafeSearch from here. 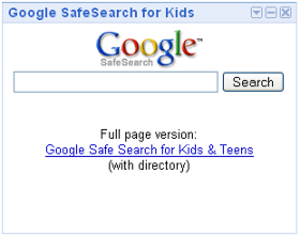 Those of you who visit my Using Safe Search on Google for Kids page probably noticed a few new links there. While these are mostly self-explanatory, I'll likely cover these in more detail in the future. However, one that may require explanation is Happy News Search. But this is exactly how it sounds. It's a search engine that searches among news sites that only carry happy or positive news. One other comment I'll make is that the popularity of the country-specific Google SafeSearch pages on SquirrelNet is inversely proportional to the country's population. That is, the Google Safe Search for Australia page is most popular, followed by Canada and then UK is last. As such, I'm tempted to explore this trend in greater detail. Perhaps I'll focus more on countries like Australia and Canada. Cheers mates! On this date three years ago, February 24, 2005, I named Google as SquirrelNet's top-rated search engine. I did so because Google kept getting better and better while GoTo.com faltered under the leadership of its new owner, Yahoo. During the past 3 years, the idea of ranking search engines has lost its relevance. Google is getting so good, so big and offering so many tools that any non-Google search pretty much fails to compare. I'm saying that Google is the only provider of search tools you will need. Since I've concluded that Google has won, I am shifting my focus to helping you make better use of Google's services. In the very near future, I will be releasing several Google-powered tools customized to suit the needs of SquirrelNet visitors. One immediate step is expanding upon Google SafeSearch for Kids. I will be putting a lot of work into creating custom versions of Google for schools, business and my loyal SquirrelNet visitors. Please contact me if you would like your own custom version of Google. For those of who are users of For Kids: Using Safe Search on Google, I've updated the kids directory section of the page with the most recent site counts from Google. We've increased the kids sites listing to 56,842 sites, an increase of 16,528 kids sites. Google Books is offering free downloads out-of-copyright books, including the complete works of Shakespeare! Google, perhaps the world's most modern comp any, has just enabled the ability for anyone to download and print out most of the least modern books in existence. Said another way, a search feature called Google Books allows users to download and print out-of-copyright books that it has scanned. Google has active participation of a number of leading libraries has been scanning entire books that are now available online. These libraries include the University of California, Harvard University, University of Michigan, The New York Public Library, Oxford University, and of course Stanford University (which is where Google was born). The format of the downloads is PDF, which can be stored on your hard drive and read at your leisure. The Free Library – access to large collections of books was the privilege of a wealthy minority. Now, with the help of our wonderful library partners, we're able to offer you the ability to download and read PDF versions of out-of-copyright books from some of the world’s greatest collections. And, by the way, chances are that you'll find Google Books' interface to these books sufficient for reading. So do the environment a favor and refrain from printing out the books. The environment thanks you! Here's a link to the complete works of Shakespeare on Google Books. By the way, this is a rare link embedded deep within Google, so please either bookmark it or this article. Google quietly unveiled a new feature this week in that they now show movie trailers on the Movies section. Didn't know Google has a movies section? Well, they do and although it doesn't have a formal name, please allow me to call it Google Movies. It's a concise list of current movies with trailer links and a link to the Internet Movie Database for each movie. You will also be able to sort by distance to theater, movie popularity, movie rating and movie title. But my favorite movies site is Yahoo Movies while many others say they like Movies.com, which is owned by Disney. Just wanted to take a minute and thank Google for their Google Web Accelerator which saved me 1.7 days over the past year or so. The Google Web Accelerator works by prefetching content it thinks you'll need and storing it temporarily on your hard drive. The net result is that it makes your web surfing faster, saving you time. BTW, it's free (go to link above). My Google Web Accelerator stats tell me that the tool ha s shaved 1.7 days off of my usage time over the past year. Assuming I really only use the tool 3 hours a day, this means that Google has saved me about 5 days of home internet usage time. That's 5 evenings free for me to spend with my family. Thanks Google for helping my family life! If MIT can build a laptop for $100, then perhaps a minimal NetPC with monitor could be built for $50 or less if mass-produced. At that price, a "PC" is not too far out of the reach of most people in China and India, although it would be a stretch given the relatively low pay there currently. Well, Nicholas Negroponte, chairman of the One Laptop Per Child Project (informally known as MIT's $100 Laptop project), has recently announced his goal is to develop a $50 laptop by 2010 as technology drives down the price of their current $137 laptop. Google is fully supporting this effort, while Bill Gates has been critical of the project since the affordable PC won't run his software. See "Bill Gates mocks MIT's $100 laptop project" for proof on the evil comments made by Gates. You see, PC's loaded with Microsoft software cost at least $150 more than they have to. As such, Microsoft is a hindrance to getting computers to developing and Third World countries. Back in May 2005 I speculated on the development of a GooglePC in an article called "Google's Future? GBrowser, GooglePC, Google NetPC and Google ISP". Many things I've predicted have already come true, and recently Google has debuted a web-enabled word processor (Writely) and announced plans for hosting user files (GDrive). Google is quietly preparing for a world in which they will host all of your data, if you desire, so that you can access your data wherever you go. For the One Laptop Per Child Project, Google's efforts mean developing countries will not need bulky hard drives, thus helping to bring the price down to the needed $50 level. Who has a slow computer? Happy Mother's Day from SquirrelNet.com!